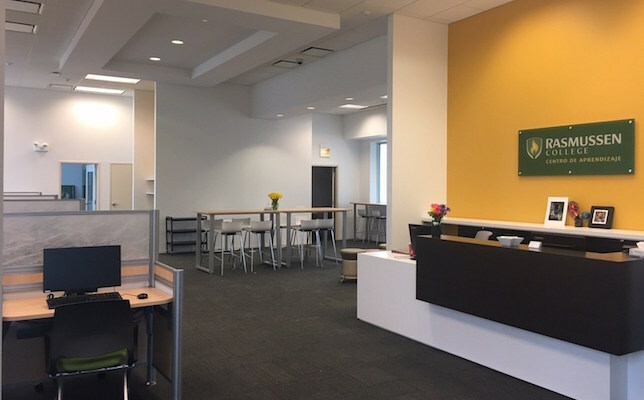 Rasmussen College, a regionally accredited private college, Tuesday unveiled a technology-infused learning center in Chicago for high schoolers, college students and community members to access the internet and receive college coaching at no cost. With the new center, Rasmussen seeks to close the digital divide in the area, while increasing the number of high school students taking dual-credit courses at the college, as well as providing a resource for degree-seeking adult students. The Rasmussen College Centro de Aprendizaje will be located inside of a building space at 3948 West 55th Street, donated by Banco Popular, residing in a southwest neighborhood of Chicago where just above half (53 percent) of families use broadband regularly, according to a 2011 broadband use survey from Broadband Illinois. Its target audience will be students who lack adequate broadband to complete homework assignments, since the lack of internet access has been cited as a contributing factor to the area’s lower academic achievement statistics in recent years. Notably, a 2012 demographic survey of Chicago found that among individuals living in the area age 25 or older, less than 4 percent hold an associate’s degree and 7 percent hold a bachelor's degree, compared to national averages of 7.76 percent and 18.25 percent respectively. A 60-inch monitor in the main learning center area with AV hook ups. To run the space, Rasmussen is working with its existing partner, the Academy for Urban School Leadership (AUSL), a nonprofit organization that manages 31 neighborhood Chicago Public Schools (CPS) serving 17,000 students. Since 2009, Rasmussen has worked with AUSL to open college access to students at five CPS high schools: Chicago Academy High School, Collins Academy High School, Phillips Academy High School, Orr Academy High School and Solorio Academy High School. The college offers students at these schools dual-credit opportunities at no cost. To date, more than 700 high school students have completed Rasmussen courses, resulting in approximately $865,000 in college cost savings for the students. According to a campus spokesperson, Rasmussen plans to expand the program to more CPS schools in the future. The space is also available for local business and community organizations “to use as a meeting space at no cost, whenever possible, a public benefit the college provides its 22 campuses,” according to the announcement.